I’ve just finished Double Down: The Explosive Inside Account of the 2012 Presidential Election by John Helleman and Mark Halperin. It’s the sequel to their magnificent Game Change: Obama & the Clintons, McCain & Palin and the Race of a Lifetime (published in Australia as Race of a Lifetime: How Obama Won the Whitehouse), which still stands as the definitive account of what was perhaps the most fascinating election in recent American history, in 2008. That volume was adapted into a TV movie, which paled in comparison to the book itself. It remains the best campaign book, and one of the best political books, of all time. Indeed so gripping that I polished it off in two sittings. Double Down doesn’t reach the same heights, in part because the 2012 contest did not have the same historical significance as 2008 when none of the candidates were either POTUS or VP incumbents. 2008 also saw the incredible rise of Obama, daring to challenge the almost-certain Democrat favourite, Hillary. And then there was the Sarah Palin factor. 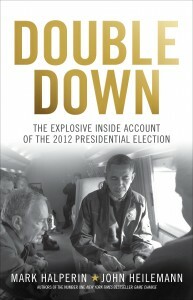 With Obama running for a second term, the majority of Double Down follows the Republican primaries, a brutal affair in itself. In fact this ritual of ‘survival of the fittest’ democratic selection surely adds another layer of advantage to the presidential incumbent; even as the Republicans eventually gather around to crown their nominee. What makes both books so strong is the depth of Hellman and Halparin’s research: hundreds of extended interviews with hundreds of participants, which gleans a depth of verified detail that builds the account into a strong and insightful narrative. I enjoy campaign books, which are in themselves an interesting genre, quite distinct from the political memoir. Like sporting stories, they follow the very familiar plot-line arc of the traditional quest. Essentially Game of Thrones, but where military might is replaced with marketing clout. It’s a game of seduction rather than conquest. But it’s not only the indulgent excitement of the chase, one also gleans much in the way of insight into the strange world of realpolitik. In some ways campaigns are the worst part of politics, with slogans, balloons, set piece speeches, and the spending of extraordinary amounts of money on negative advertising. But it’s also a theatre which can reveal much about the nature of politics in our time. For example how policy is generated and refined on the run; how vast slabs of money is generated and how; how journalism is changing through social media; how backgrounds vetting is executed (it’s hard to see how New Jersey Governor Chris Christie will survive a 2016 run); how small details in personal style are heightened; how gaffes are exploited; and how politicians relate to one another, with certain codes and quirks. One of the most notorious campaign books is Hunter S Thompson’s Fear & Loathing on the Campaign Trail ’72, which broke new ground in political journalism through his gonzo style. But if Hellman & Halparin’s are two of the best; Australia has recently produced a few of the worst. Bruce Hawker’s 2013 account The Rudd Rebellion: The Campaign to Save Labor was rubbish despite, or rather because, it was written by the Campaign Director. It contained few political insights, zero revelations, a plodded style and I threw it away before the end. Only marginally better was Confessions of a Faceless Man: Inside the 2010 Election by Union leader Paul Howes. Perhaps demonstrating that partisan accounts in such heated contests make for dull ‘official’ recollections. The far superior account of that election was Barry Cassidy’s The Party Thieves: The Real Story of the 2010 Election now generally, and rightly regarded as the definitive story of that campaign. Worth a read also is Pamela Williams’ The Victory: The Inside Story of the Takeover of Australia about the 1996 Howard contest to beat Keating, presenting detailed insights into the revamped Liberal campaign machine, then spearheaded by Andrew Robb. And although it’s a memoir rather than campaign diary, Tony Parkinson’s Jeff: The Rise & Fall of a Political Phenomenon contains an insightful account of Jeff Kennett’s devastatingly effective 1992 landslide victory in Victoria. Mark Latham’s The Latham Diaries is perhaps the most compelling and stark insight into Australian political life published. It is a brutally frank recollection of life in the Labor party leading up to, and through the 2004 federal election, and records how traps are set, people rubbished, manoeuvres outlined. It’s a full-on account of party realpolitik, which veteran political journalist Paul Kelly called perhaps the most significant book ever published on Australia politics. Lastly, a fond recommendation of Bob Carr’s recent Diary of a Foreign Minister. Largely mocked for his inclusion of personal details on his taste for luxury ties, and distaste of being downgraded to Business Class on certain flights, it’s actually a very interesting book, where he manages to explain various layers of the nature of foreign policy from a unique angle. Where Latham took himself incredibly seriously, Carr’s satirises his own ego, and playfully posits his own idiosyncrasies into a storyline which sees him dashing around the world, all the while the Government burns at home. It’s not really a campaign book, indeed Carr’s tries to avoid the 2013 campaign which will mark the end of his 18 month sojourn of statesmanship. We get dinners with Henry Kissinger, coffee with Ban Ki-moon and detailed accounts of the manner of bilateral discussions with Hillary Clinton and William Hague. We also get his view of (multiple readings of) Russian novels, essential small galleries to visit in New York City, and detailed rationals for his diet and exercise routines. Bob Carr is a classic example of the Australian dandy. Vain to the gills and precociously postured. His ability to self-reflect so playfully and willingly demonstrates he is probably not as eccentric as he’d like to believe. Eccentric’s tend to hide, and Carr has carefully recorded and edited 477 pages about himself, after all. But alongside all this we get significant perspectives on a wide range of foreign policy matters, from the perspective of the Australian interest. Sharing emails from ambassadors, and conversations with heads of state, Carr’s indiscretion make for fascinating reading.